I just thought Rugby League was played here. 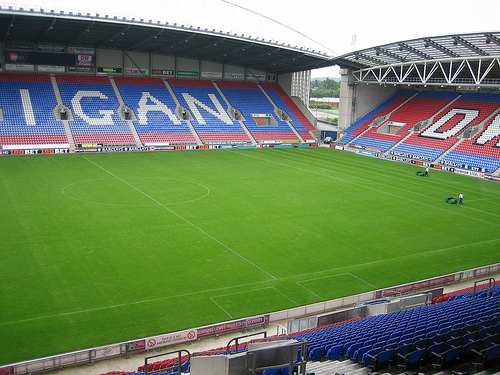 The town of Wigan – population around 80,000 – is reeling from the sudden realisation that they seem to have a team in the top flight of English football. It seems that the team – one “Wigan Athletic” – have been in the Premier League since 2005 without anyone in the Greater Manchester area or beyond really noticing. They play at a virtually new 25,000 seat capacity stadium and even managed to finish tenth in the 2005-2006 season. They’re managed by a Spaniard and have players of several different nationalities in their squad, rather than a few chain-smoking Mancunians and Lancashire journeymen. People in this Rugby League mad town have been stunned by these revelations, swelling the sides – known as “the Latics” – most recent attendance to a massive 8,000 supporters wondering why only two people on the pitch were allowed to use their hands. The management of the club have an amusing penchant for signing unknown South American footballers for large amounts of money, some of whom seem to be decent and some of whom seem to be called “Franco Di Santo”. The club does have some regular grounding amongst all this unexpected wackiness, however. They are owned by a hyper conservative gobshite northerner and for all the overseas flair they still seem to believe that the Caldwell brothers are in some way gifted footballers. Normal service is expected to resume in the next few years as the team slide from their current massively unexpected position back to the fourth tier of the league, playing teams like Stockport County and Rochdale. Another shocking development is on the horizon though as it seems that a team from Wales might get promoted from the Championship this year. Whatever next!